As a pop concept, Snooker Emporium almost died once. They hung on til the end—the last shows were played without a permanent drummer—and then we went home and some of us may have thought about friends and bandmates moving away, and how cruel it was that fate killed dreams by negligence. But you are young and that means it is o.k. to be misunderstood. Here is a platform (I hand it to you), make weird art. 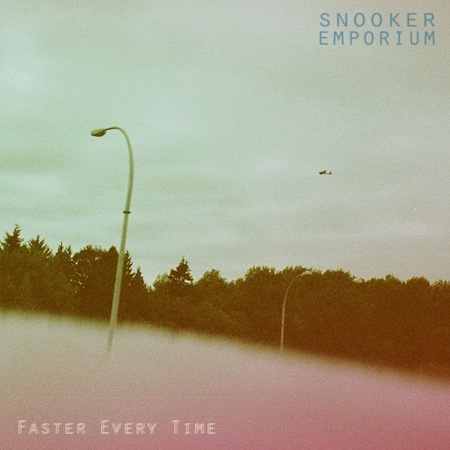 Indie rock is the art of the collage, and that’s often what Snooker Emporium looks like. Oh yes, they can do the highly-structured, synth-heavy psychedelic cut with hugest fuzz guitar leads, Doug Martsch is Floating in Space, etc. Yet reviewing them as an indie rock band is not helpful; something bizarre floats through it. In any case, Faster Every Time serves as a slightly unusual introduction to this project: its three tracks were written by different band members (Arthur Rossignol, Nick Nausbaum, Jono Currier), which put their various weirdnesses through the centrifuge. Parts were recorded independently and handed on for overdubs. Overall, they did get less on the ceiling than the in situ jams of old. A cleaner kitchen—but this is just process. The unlighted corners are not less unsettling. Take “Why & How”—throughout the EP opener, quite a few subtleties work to dodge our expectations of non-weirdness. During the “verse”, the number of quarter notes per bar switches every bar. The effect is drifty, not jolting, since we barely perceive it. Rossignol’s vocals are controlled softly through the builds, although they may as well be perishing in alt rock for all the impact. Currier’s drums hit some quirky places but stay slow and deliberate. When the parts change, each section holds on to some element from before—building, and triangulating on something kinda pop punk—we don’t notice that the verse never came back when it was supposed to. And then, for a moment right before the end, when they are pulling out all the stops, we’re sure we’ve heard this once on MuchMusic. It’s well-executed. It tricks you into accepting its weird self for a familiar pop song. Maybe that’s what Snooker has been doing as a band this whole time. Stick all these unconventional artrock ideas into something that sounds exactly like an accessible, homey, comforting guitar pop hit, and we will listen wherever; even the sad songs are feelgood. No brainer that the way to your heart turned out to be through pop music. They will hook you, draw you into their freakstore emporium and whisper, please stay forever. What if you can’t, though—do you go home again? Remember this EP exists because there was something still to share in rattling breaths. It wasn’t a swan song so much as a celebration of the death of opportunity. Some of us graduated art school. Yet somewhere in between it all, fortune spoke via original drummer Brandon Waldon’s return to Montreal (he even plays on a cassette-only bonus track). Even if—especially if—you have not listened to this band before now, I hope your near future is great. Could be we just need a big hello (HELLO) and a good pinch post-resuscitation. Fly on, talented people.